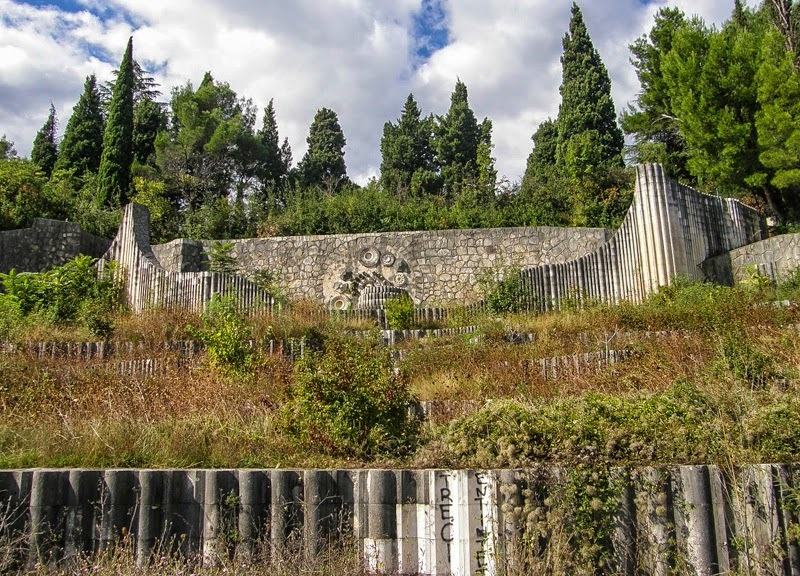 A memorial to the fallen Yugoslav Partisans of World War II, carved out of a hillside in the beautiful, divided city of Mostar. For those who like their architecture monumental in scale and subject to some picturesque decay, the Partisan Cemetery provides a quiet respite from the bustle and tourist tat of the Old Town. 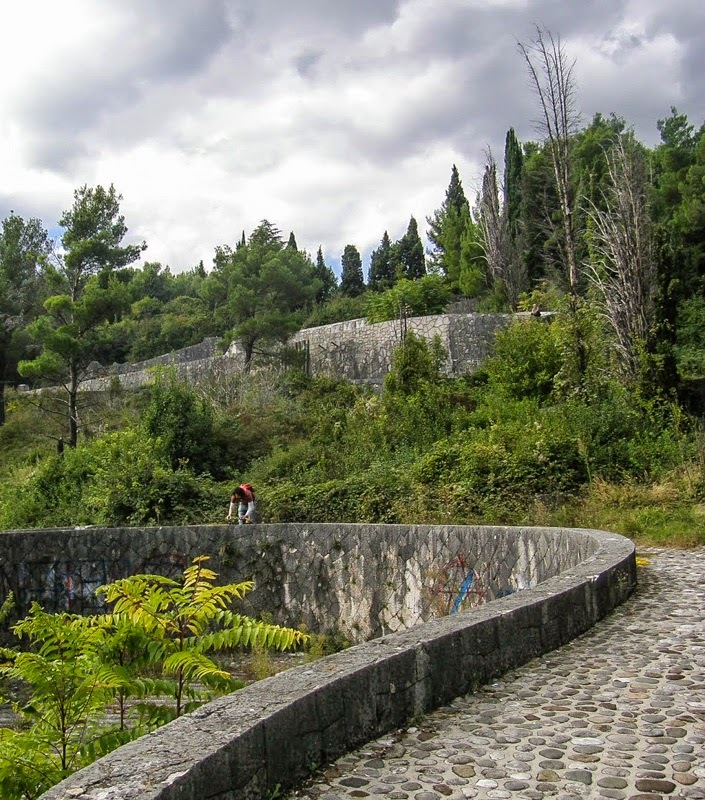 Climbing up the curving terraces also gives lovely views over Mostar and the Neretva valley. In the Western half of Mostar, in southern Bosnia and Herzegovina. Map. 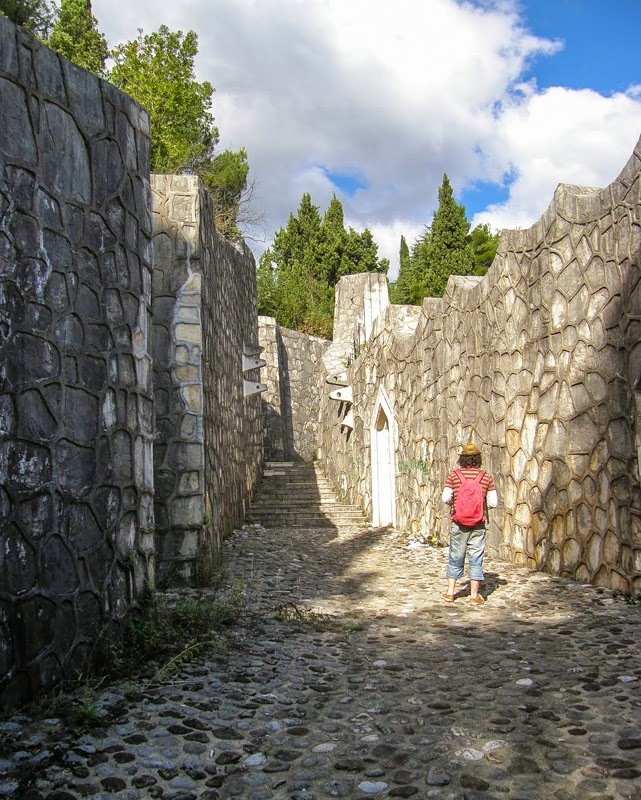 ALTHOUGH HORDES OF people visit Mostar and its UNESCO World Heritage-listed Stari Most, it seems that most of them simply come on bus tours and never venture outside the Old Town. Strike only a bit further afield from the shops selling cheap jewellery and key rings made from bullet casings and you quickly leave the tour groups behind. The Partisan Cemetery is a National Monument of Bosnia and Herzegovina, and yet at the time of our visit the only other people there were two old men enjoying a quiet smoke. And given the size of the site, they were in no way intruding on each other’s solitude. The cemetery is listed as a stop on the local Death of Yugoslavia walking tours, but the one poster advertising them in the Old Town was the only evidence we ever saw of these tours actually existing. Certainly there were no groups in sight when we were there. Walking through the grass to the entrance, you get the feeling that the remains of paving stones once formed a grand processional way. Now the gates are less Mordor, and more country park, half obscured by trees and other greenery. Walking through the final, enclosed passage to reach the reflecting pool. 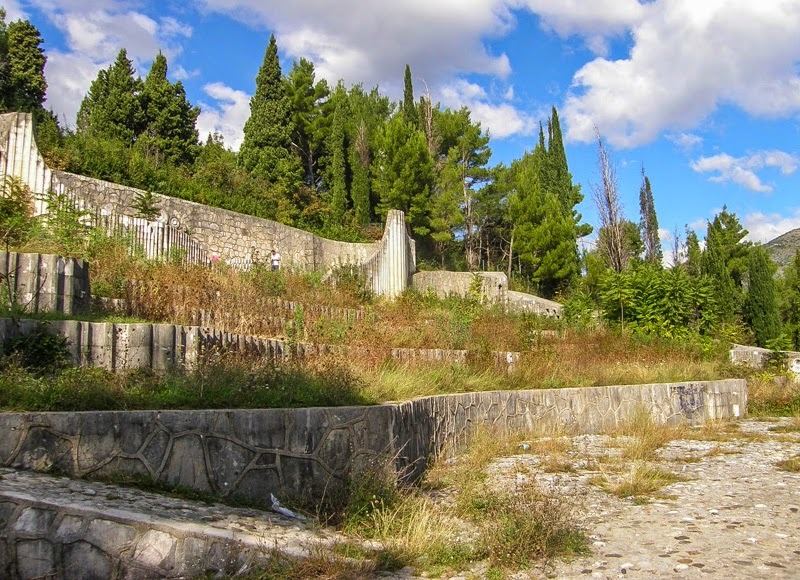 The cemetery was built for Mostar’s Partisan soldiers, the communist resistance fighters who served under the command of Josip Broz Tito in World War II. 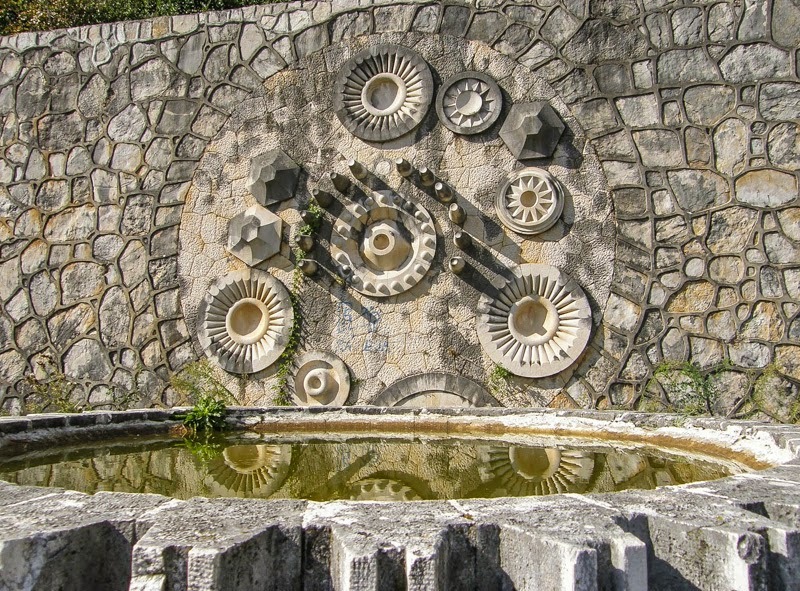 It was designed by Bogdan Bogdanović, the architect of a whole host of anti-fascist memorials and monuments in the former Yugoslavia, and was opened in 1965 by Marshal Tito himself. A series of sweeping, curving paths work their way up the terraces to the top of the monument, which is crowned by a pool reflecting massive carved stone gears adorning the wall behind. More than five hundred Partisan fighters were buried here, but the headstones are almost entirely hidden, lying as they are beneath the undergrowth which is slowly taking over the stonework. There’s no obvious sign of the damage the cemetery sustained in the war in the 1990s, despite the walk to the monument being made slightly somber by the still-ruined shells of shelled houses. The damage that does exist seems more recent, such as the strange stone protrusions lying crumbled at the base of the walls that tower over you as you make your final climb to the top, and the fascist graffiti defacing this memorial to anti-fascists. Although the cemetery was cleaned up and re-unveiled in 2006, it’s since been left to fall back into disrepair. Closed-toed shoes are a good idea, as there’s lots of broken glass and other detritus lying around amongst the weeds. From the Old Town, it’s about a mile walk along Kralja Petra Krešimira IV, a pleasant tree-lined street. The unmarked entrance to the cemetery is on the left just after you cross Nadbiskupa Čule, through an overgrown empty lot. The cemetery is labelled on some maps of Mostar as the Monument to Anti-Fascism, but Google Maps is still blissfully unaware of it. 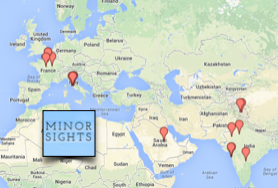 Of course it can be found on Minor Sights' own map. Rachel Carson spends much of her time at work putting the travel books back into their proper countries. Off-hours, she’s always dreaming of her next great adventure, which seems to be getting further eastwards every year. You can find her on twitter at @carson_rachel. This is the only clear and precise information about the cemetery I've found on the internet! Thanks! Glad it was helpful. When are you visiting?